One of the craziest this year's games - Saints Row 4 - has got a very special and completely insane edition. If you are rich and crazy enough, you can buy "Super Dangerous Wad Wad" pack that is available in single edition and costs $1,000,000. Well, at least it consists of fantastic things. 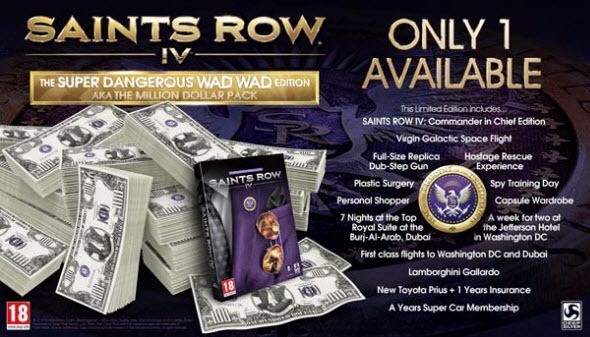 The most expensive Saints Row 4 pack includes Commander-in-Chief edition that consists of an Uncle Sam suit, replicas of the game's weapons, plane and Saints Row 4 itself. Also you will get 2 fantastic weeks in the luxury hotels in Dubai and Washington with the first-class flights between these two cities. Moreover, your holidays there will be very intensive and fun. Thus, you will be shopping with a personal stylist, which is going to develop your own president's style; you will visit plastic surgeon, get the day of spy lessons and the hostage rescue training, and in the end you will fly to space! And after this awesome trip you will get a couple of "souvenirs": brand-new Toyota Prius and Lamborghini Gallardo. So, if you have unnecessary 1 million dollars, this is your chance. And for those, you are not going to spend so much money, the developers have prepared another surprise - new dev diaries with a great game footage. Enjoy! By the way, this Saints Row 4 edition is not the only one crazy offer in the history of gaming. In spring we reported about GRID 2 Mono Edition that costs $189,000. And it hasn't found its buyer yet.